It can be blog subscribers, webinar subscribers, email leads, social media followers, and many other types of them. Due to the fierce competition, it’s not enough if something just eyeballs your website. You need to capture the prospective information so you can market to them even after they have left your site, this is where lead magnets come in. It’s a noun which stands for an irresistible bribe which offers a lump of value to prospect in exchange for contact information. The goal of the lead magnet is simply to attract many visitors to "sign up" for the offer your site is offering. The higher the click-through rate a lead capture records, the better performing it is. Some good examples would be a case study download, checklist, cheatsheet, or even blog subscription. What should you consider while you create a magnet? The list is very diverse, and it needs your consent. Considering that, following we are giving you the ultimate checklist to create useful and valuable magnets. Make sure you catch up with every detail. The very first aspect of your checklist is to ensure your lead magnet is not complicated. Top tips to improve your internet marketing! Obviously, the internet marketing term is way too broad, it can be SEO, social media optimization, web development, Adwords, etc. Which subject is it referring? No one knows until we download or open the promised file. Now this is specific and goal oriented! To make it even better, you should refer to your customer prospects and ask what they really need and want. What are they exactly searching? If you ca give a very specific solution to a particular problem, then your lead magnet should do just fine. Here is a good example from Neil Patel's blog. This satisfies both requirements: specific and goal oriented. Why though? Sharing a journey may be too broad, no? Not really.. on second thought, it's specific enough. "I'm sharing everything on my journey..."
It's all about day-to-day tips from what Neil faces and experiences in building his blog. And see the goal that's clearly stated there? 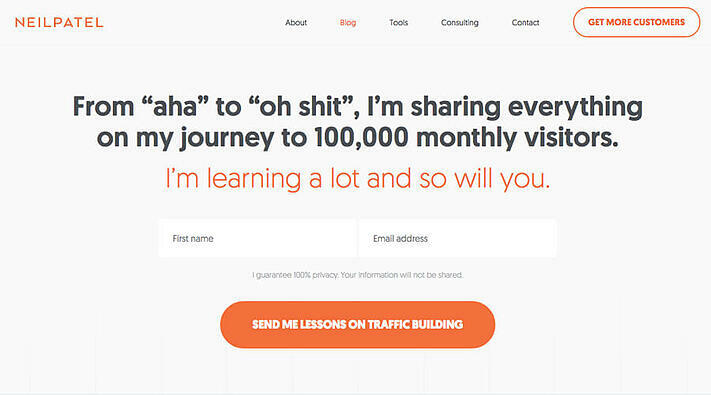 "My journey to 100,000 monthly visitors"
It can be translated to: "If you want to grow your blog to attract 100,000 monthly visitors, then subscribe to this email list!" The problem is everyone in the world is looking for a magic pill. They want a significant instant improvement instead of little ones over the time. The result is never impressive. The lead ideas should also convey the fact that you are trying to improve your relationship with your visitors. In this case is to get their email addresses or any other biographic details from them. Instead of creating a capture that "targets" every kind of visitors (who obviously have different problems), why not create multiple "smaller" lead magnets that target each visitors' problem? Once again, you will have to think from your customer’s perspective and consider their needs. Think of what they are struggling with the most. If you have done enough research about this, then you will have all of the information to craft the most efficient magnet for your business. In short, you need to become the pain-killer for the headaches of your clients. 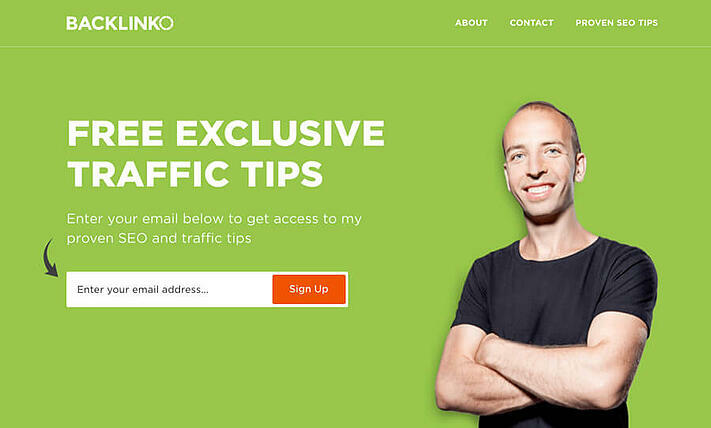 Offer something that your visitors can't decline. 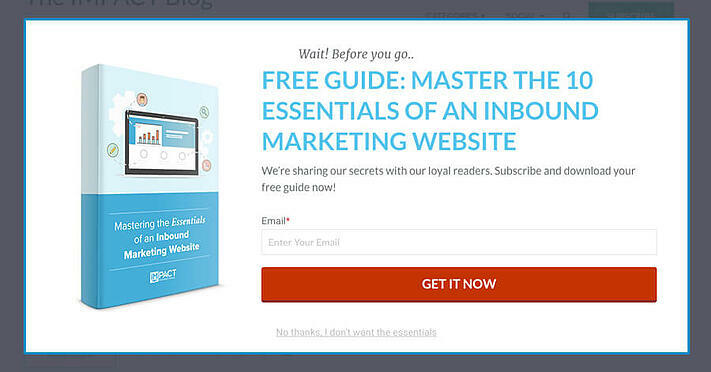 Here is an example of a good lead capture that most visitors can't say NO. Our friends from Impact craft it. See anything special here? Besides the big attractive "Get it now" button" and also a well-designed guide cover, the use of alternative close button is effective. Eh.. Where is the close button? You might be asking the question, look closely to the underlined text under the red button where it says "No thanks, I don't want the essentials." Not only it triggers the visitors psychologically, but it also makes them think twice before even clicking it. Here is a hint to motivate you, it’s better if you talk about the size of holes instead of the size of drill bits. Here comes the critical element of the whole discussion! If something doesn’t provide you satisfaction, it’s not worth it. People want things in an instant, and you need to consider it in your lead magnet. Will they get the resource in an instant? Will they get the results in an instant? In case the answer is yes to both these questions, then you are in good shape. A good magnet system should do much more than just educate your client. As I said, the lead capture needs to get your customers think about particular resources. They also should think of it as, how will the company help me with something beyond what visible at this point. Will this assist them to move any closer and warm them up to do business with you? This is a crucial question, and you should ask this before compiling your lead capture checklist. The fact is, you are not even close to being done other, you need to make other offers down the line as well. This is achievable if you provide a little victory with noticeable results. The offer has to be good, and it should deliver results. If something is free, it doesn’t mean you should make it look like free. You should put use to professional graphics and imagery to establish some real money value for your lead magnet template. If you deliver your lead magnets bland, colorless or even imageless PDF, It won’t do you any good. Even if you content is considered to be great, it won’t inspire anyone unless you create a lead magnet free which seems like it has a ton of work done on it. Just make sure to make it a professional look. And here is another example from our friend Brian Dean from Backlinko. Professional doesn't always mean complex and complicated design, it can be as simpe as a portrait of yourself smiling with clean flat background. As long as it looks trustworthy, it will work. Another example of clean and professional lead magnet design from Melyssa Griffin. When you deliver a magnet to your visitors, it has to be of some use. In simple, words, it should be exceptional content. A chance for you to impress as well as help your clients. In case your magnet barks and fails to bite, it will lose the attention, and you will see losses in the sale. Creating an attractive magnet is important, but what's the point of making it attractive if the content itself isn't useful? Think about it. As designers always prefer. Always craft a great content first before even start designing it. 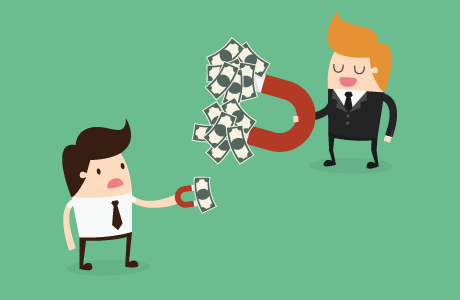 You have to make sure the lead magnet doesn’t block your sales funnel. In simple words, it should be consumed or prove its worth within 5 minutes. To put it simply, a 200 Page ebook and a 6 Week course will be a poor choice. The fact is, most people are looking for quick gratification. If it takes a bit long for them to consume, they might lose interest or something else gets their intention. You need to get their attention as soon as you can or it will be a lost cause.